Hi! I’m Heather from Hezzi-D’s Books and Cooks. I’m a special education teacher who loves making homemade meals. Since I work all day I usually prepare quick weeknight meals at night. 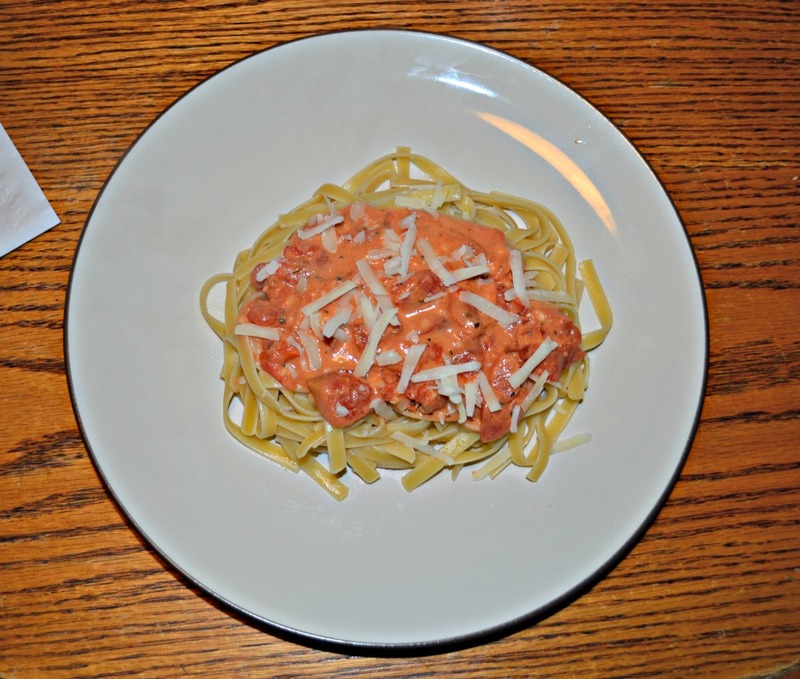 I’m also a frugal shopper and when Brenna was looking for guest posts I knew I could deliver an easy, quick, and frugal meal perfect for parents. As you know, I’ve been trying to eat healthier yet make meals that take less time and are cheaper. Since pasta is my favorite meal, it’s been fairly easy to cook more frugal but I’ve been struggling to find pasta dishes that are healthier. Of course, Cooking Light came to the rescue again. They always have easy yet flavorful meals that are lighter on fat and calories then many of the meals I make. They had a delicious pasta in a cream sauce with Parmesan cheese sprinkled on top. It sounded perfect so I whipped it up in about 25 minutes after work one night. I loved how simple it was and that I already had all the ingredients in my kitchen. 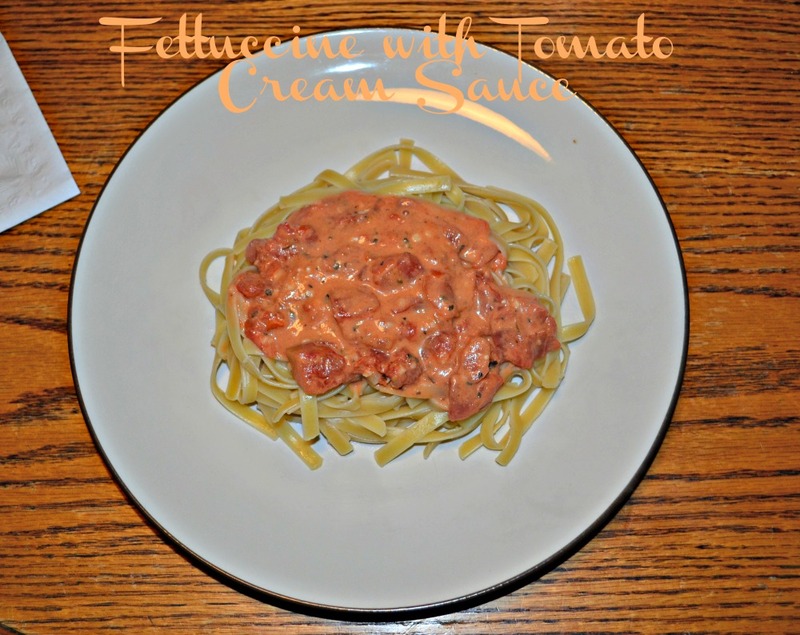 The sauce was creamy but not heavy and the sprinkle of Parmesan on top added just a bit of flavor and saltiness. This meal makes around 4 servings and came in at around just $1.00/serving! Cook pasta according to the package directions. Drain pasta, reserving 1/2 cup of pasta water, and keep pasta warm. Meanwhile, place the garlic, diced tomatoes, red pepper, salt, and Italian seasoning in a large skillet. Cook over medium heat for 15 minutes, stirring occasionally. Add in the fresh parsley and stir well. Stir in the reserved pasta water and cream cheese, turning the heat to low. Mix until the cream cheese is mixed into the sauce. Divide pasta between 4 bowls and top with the sauce. Sprinkle with Parmesan cheese. Thank you so much for sharing this meal, Heather. I’m a big fan of pasta also, so it is great to have lighter ways to enjoy it.